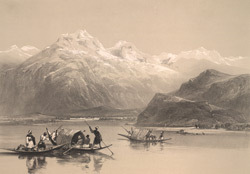 bl.uk > Online Gallery Home	> Online exhibitions	> Asia, Pacific and Africa Collections	> Kashmir: Wulur Lake. Plate 12 from "Recollections of India. Part 2. Kashmir and the Alpine Punjab" by James Duffield Harding (1797-1863) after Charles Stewart Hardinge (1822-1894), the eldest son of the first Viscount Hardinge, the Governor General. This depicts a view of Wulur lake amidst a mountainous backdrop. This is said to be the largest freshwater lake in India. It can spread over nearly 200 square kilometres but its actual surface area tends to vary during the year. The Jhelum River flows into the lake, 40 kilometres downstream from Srinagar, and then out again. Although the lake appears calm, it is noted for the fierce winds that sometimes blow up. The deepest part of the lake is known as Mota Khon, the 'Gulf of corpses', since the bodies of people drowned in the lake are all supposed to be washed here.